Mania Hotel in Stara Zagora city, Bulgaria. 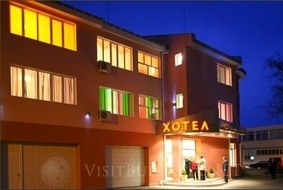 Location: Family hotel “Mania” is situated in the eastern part of Stara Zagora city, near the Bedechka Park. The location of hotel “Mania” combines the quietness of the small neighborhood with the dynamics of the big city, within 5 minutes drive from the centre. Accommodation: There are 12 elegant rooms and 2 apartments in hotel “Mania” which are furnished in their own unique way, each with its own glamour. Every room is equipped with local heating system, air-conditioner, telephone, TV, LAN and Wireless Internet connection, cable television and bathroom. A mix of modern design, warm colors and aesthetic beauty makes you feel comfortable and cozy. The hotel has at its disposal a conference hall for presentations, conferences and wedding ceremonies; restaurant with 60 seats and a summer garden. Mania for the detail and the high service standard are the hotel’s main priorities. Hospitality, comfort and pleasant atmosphere are premises for an unforgettable experience. Wine & Dine: Restaurant Mania has at its disposal 60 seats and a summer garden. The interior combines the spirit of the French province and the warmth of the Bulgarian customs from the beginning of the 20th century. The meals offered are symbiosis from the European and Bulgarian cooking. The wine list includes 30 kinds of wines from the most popular wine-cellars in Bulgaria. When a reservation is made in advance you will be surprised with a table decorated specially for you and your occasion.The restaurant is suitable for wedding ceremonies, cocktails, personal and traditional celebrations. The warm service, the cosy atmosphere and the excellent cooking are premises for an unforgettable culinary experience.